Is Uber ripping people off? Ask Gett, one of its competitors, and the answer is a bold yes. 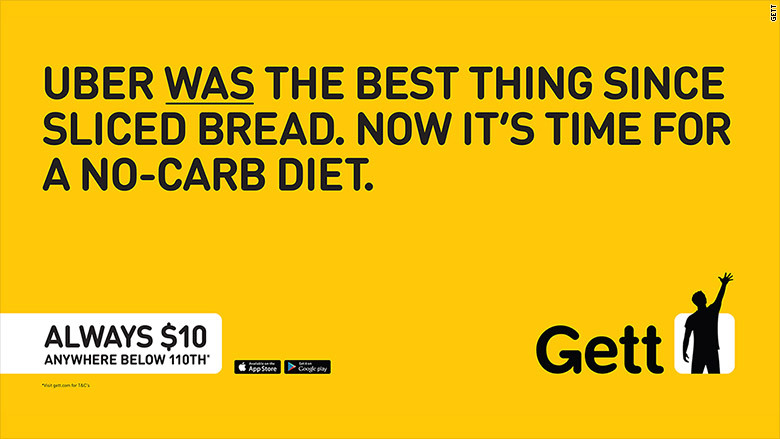 Monday, Gett is launching its first big campaign in New York City. Its beef? Uber's surge pricing. Unlike like Uber and Lyft, Gett doesn't jack up its prices during periods of high demand -- a policy known as surge pricing. In New York, Gett charges a flat fee of $10 no matter the time of day. "The competition, who we shall not name, is über ripping you off," reads one of Gett's new ads. Gett launched in Israel in 2011 and has been operating in Manhattan (its only U.S. market) since September 2013. "Surge isn't needed," said Shahar Waiser, founder and CEO of Gett. "We've found that people have this surge fatigue." The company has banked $207 million and is on track to bring in $500 million in revenue this year, according to Waiser. He said the company is growing 300% year-over-year and is profitable in 24 of its 50 international markets. Gett plans to use that money to grow its New York City customer base. Gett's new ad campaign will put 500 ads around Manhattan -- on phone booths, buildings, elevators, newstands, bus shelters and bathrooms. The ads are aggressive ("Subjectively, we're objectively better than Uber.") yet playful ("The only time we surge is never o'clock."). Waiser declined to disclose how much Gett spent on the campaign but said it "wasn't as much as you'd think." Its mission is to appeal to city dwellers -- both customers and drivers. Gett currently has a fleet of 2,000 drivers -- not enough to meet demand, said Waiser. He added that Gett pays drivers more per minute than Uber and drivers keep 100% of their tips. 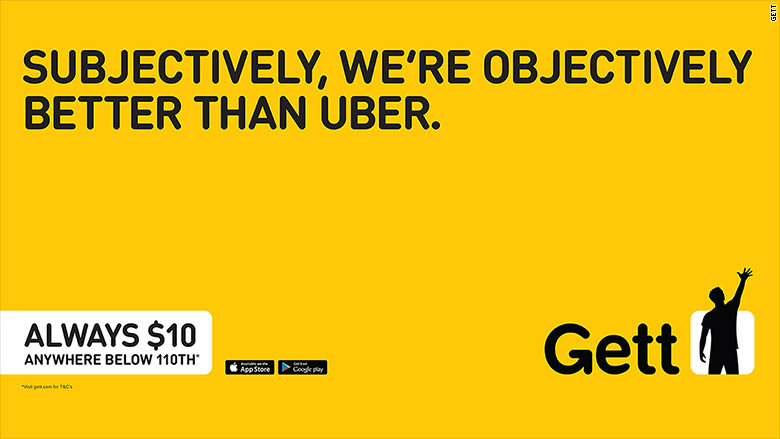 Gett aims to differentiate itself from competitor Uber with an aggressive new ad campaign.